Realiance on physical instead of (bio-)chemical principles. No cause for system inherent signal drift or system deterioration. Very short to none internal system lag time. High measurement frequencies are possible (e.g. 3 measurements per minute). No necessity of energy supply for body-internal parts of our devices. No a priori runtime limit. No consumables (with the exception of energy sources for the body-external units). Both approaches have potential for minaturisation down to nano scale, further increasing patient acceptability of the implant. Both approaches will result in a reliable, easy-to-use, pain-free, continuously working glucose monitor without stigmatising the user. We will disclose more technological details below on one approach only, but we are very confident in the second approach also. The patent application “ Blood glucose sensor and measuring method for determining the blood glucose level”, to which ABOYA has exclusive access, describes the utilisation of a small reflective disc, implanted under the skin in the region of the subcutaneous fatty tissue. This enables ABOYA to create a sensor system, which can monitor changes in glucose concentrations by the use of optical rotatory dispersion (ORD). The ABOYA ORD Continuous Glucose Monitor (ABOYA CGM) will consist of a light source, which produces polarised light beams of sufficient quality. The light is sent into the skin with a fixed angle. 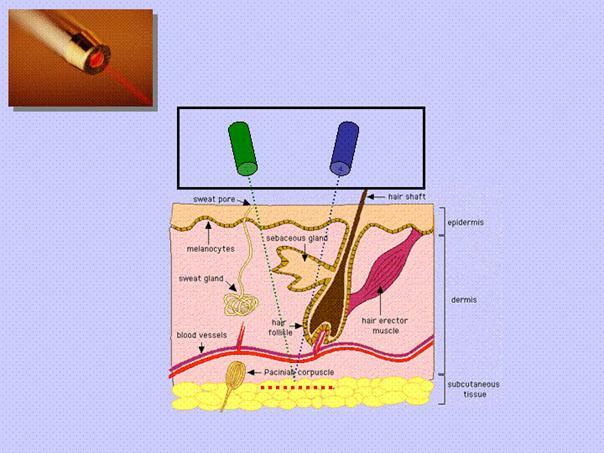 Many body tissues such as skin exhibit significant scattering and hence depolarise the light passing through them and provide low signal-to-noise ratio. Therefore, with conventional sensor configurations (e.g. sensor on opposite side of finger, sensor placed in the vicinity of light source) it is not possible to obtain optical rotatory dispersion signals of sufficient quality. The high quality polarised light beam is reflected at the disc placed about three millimetres beneath the surface of the skin. A polarimetric sensor placed in close vicinity to the light source identifies the angle of the optical rotatory dispersion of the reflected light. The figure below shows the schematic principle of the ORD-based ABOYA CGM. The sensor measures the angle of rotation of the reflected polarised light beam. From this value we can calculate precisely the changes in the glucose level in the subcutaneous tissue. By the use of traditional glucose monitoring systems the ABOYA CGM can be calibrated and its values can be linked to blood glucose values. From then on, the ABOYA CGM displays the absolute glucose concentrations and acts as a real online glucose monitor for the patient. The ABOYA CGM will be equipped with alarm functionality for both hyperglycaemic as well as hypoglycaemic states and will work continuously. A polarised light beam, emitted by the light source (green) goes through the skin and is reflected by a disc-like structure (red dotted line) in the subcutaneous tissue. The molecules in the path of the light beam alter the plane of polarisation. The reflected light is analysed by a polarimetric sensor (blue). The distance between the extracorporal unit and the reflective disc remains constant and controlled additionally by a seperate sensor. In contrast to the continuous glucose monitoring systems already presented, the ABOYA CGM has no a priori runtime limit. This means there is no requirement for “disposables” or “consumables” (e.g. sensor cell or fluids), which must be exchanged after a given number of hours or days. Of course its energy supply limits the operating time of ABOYA CGM. However, these are expected to keep the system up and running for at least a period of several days at a time. Some points are important to note. The reflective disc, placed only millimetres beneath the skin, enables a strong signal-to-noise ratio of the measurements. The distance the light beam has to travel will be less than one centimetre. Moreover, the distance between light source, reflective disc and sensor remains constant! This is a very important fact, since only a constant distance allows the use of the technically elegant polarimetric measurement. To date all hand-held optical continuous glucose monitoring systems have been hampered by variable and indeterminable travelling distances of their light beams, or have relied on longer distances between source and sensor. The reflective disc, a flexible and thin element about 15 millimetres in diameter (the size of a 1 Euro-Cent coin), will be inserted into the forearm by a minor, ambulant surgical intervention. Personal discussions with diabetic patients have confirmed that most would prefer this single minor intervention over constant finger pricking. It is not necessary that the disc is located exactly in a depth of about three millimetres or that the overall orientation of the disc is absolutely in parallel to the skin surface. The reflective foil will remain in a quite constant position towards the sensor, thereby allowing a precise measurement. Furthermore, the sensor will scan for minimal changes of distance to the disc by advanced optical techniques or electro-magnetic distance sensors.